Mobile Food Vendors often need a variety of licenses to operate in each jurisdiction. The licenses may be specific to their business activity or generally required of all business that generate income and have employees. Mobile Food Vendors should always research license requirements before attempting to operate in a new jurisdiction. Mobile Food Vendor licenses are typically issued locally by the County or municipality in connection with local Health Departments. Some states, such as Alaska, Delaware, Florida, Michigan, Minnesota, and Texas issue Mobile Food Licenses. State and local Mobile Food Licenses may be required simultaneously depending on the jurisdiction. The mobile unit will typically needs to be inspected by the appropriate Health Department and, in certain jurisdictions, such as Chicago and Boston, a fire inspection by the local Fire Department is also required. These licenses will generally need to be renewed every 1-2 years. In certain cases, temporary or seasonal licenses are available for a smaller fee. New York City offers a seasonal license running from April 1 to October 31. The fee is $10 as opposed to the $50 fee for a full-term 2 year license. The state or locality will generally have hours of operation restrictions in place for mobile food vendors. Additional licensing if often required, such as Payroll Tax, Sales Tax, Business Licenses and Registration with the State as a domestic or foreign entity. For example, in order to apply for a Mobile Food Vendor License and operate in Phoenix, Arizona, you will likely also need a Phoenix Privilege Tax Registration, an Arizona State Privilege (Sales) Tax License, a Maricopa County Mobile Food Vendor Permit and Registration for your business with the Arizona Corporation Commission. In order to operate in Boston, Massachusetts you may need a Massachusetts Peddler License for each individual who is collecting money on the mobile unit, Health Permit, Fire Permit and a Boston Business Certificate. State sales and payroll tax may also be needed in both cases. 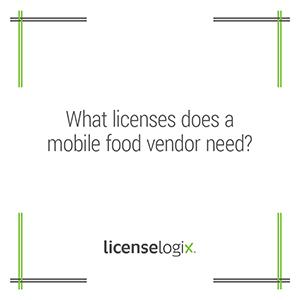 LicenseLogix will help Mobile Food Vendors obtain all licenses and registrations, minimizing time-consuming and costly delays. If you are already licensed, we can manage license renewals and ongoing license compliance. For additional help you can fill in the form on the bottom or give us a call at (800) 292-0909.